There's a certain tension in our house when it comes to the interior display of the antiques and folk art that we collect. Notwithstanding the fact that I've sold many, many nice pieces over the years, we continue to acquire objects so there's a pretty constant flow of antiques and folk art objects coming into the home, or at least into the garage, the holding area for recent acquisitions! For the last several years, Joan has been a "less is more" type. She believes that a small number of artistic items in a room heightens their visual impact. Of course, I am a "more is more" type. I like lots of objects in a room. It's busy but the various shapes, sizes and colours create quite a mix. Besides I like looking at the objects we've collected. There's a story behind every one of them. Each time I look at an object, the memory of how I acquired it flashes through my memory. Some people collect trinkets from their various trips to far off places. When we travel in Canada, I like to buy an antique or a piece of folk art as a memento. 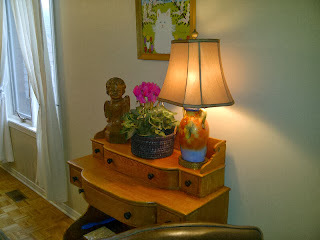 Even with a "less is more" interior design motto, Joan likes to change things up, so at least twice a year I find myself rearranging furniture in the various living spaces in our home. More often than not, this process produces a net surplus of antiques or folk art which by default have to go to the man cave - our repository for the "more is more" side of the equation. It almost happened again on the weekend but somehow I managed to rearrange the antiques and art in the family room without "losing" anything to the man cave! "Joanie, don't you think a cupboard at each of the sofa looks so, well, symmetrical" I blurted, my eyebrows arching hopefully upwards as I waited for a reply. "It's sort of like book ends," I added confidently. The withering glance I got back from Joan spoke volumes. On this occasion, however, she relented and, for now, we have cupboards book ending the sofa! Isn't life wonderful! On the other hand, the basement space, the man cave, is where I can let loose with the antiques and folk art. I can stack, arrange, fill and shelve as many objects as I like. Or at least to date I've managed to do that. And although I've achieved "detente" in the man cave, there are no signed documents or treaties so, like a small country in the shadow of a superpower, I live with the uncertainty that Joan (the super power in this case) may have a change of heart and set her sights and her "less is more" ways on the lower level. Unless and until that day comes however, like a squirrel confidently building a nest in the garden shed, I live in equally happy and ignorant bliss, surrounded by the antiques and folk art items I've gathered up over time. The Markey Man Cave - Where More is More! And be very aware of the "let's paint the house" approach to downsizing your antique collection. A friend of mine agreed with his partner to paint the interior of their home and of course moved out the antiques and furniture to facilitate the task at hand. Once finished, he had a devil of a time getting his antiques back in! The less-is-more approach had struck again! Although you don't realize it at the beginning, most if not all collectors face the issue of "space" or the lack thereof. Unless you're collecting postage stamps or a similar dimensionally unchallenged collectible, at some point in time you're going to run out of space. Either that or you stop collecting. The latter is certainly not the solution for the majority of collectors. I imagine there are collectors who collect furniture and art to the point where they have every room in their house furnished and adorned exactly they way they want it. And then they stop. I can't do that. And none of my collector friends can do that. Why should you stop something that's so interesting and fun to do? Besides if you stopped acquiring, I'd have nothing to talk about with my buddies down at the antique market! 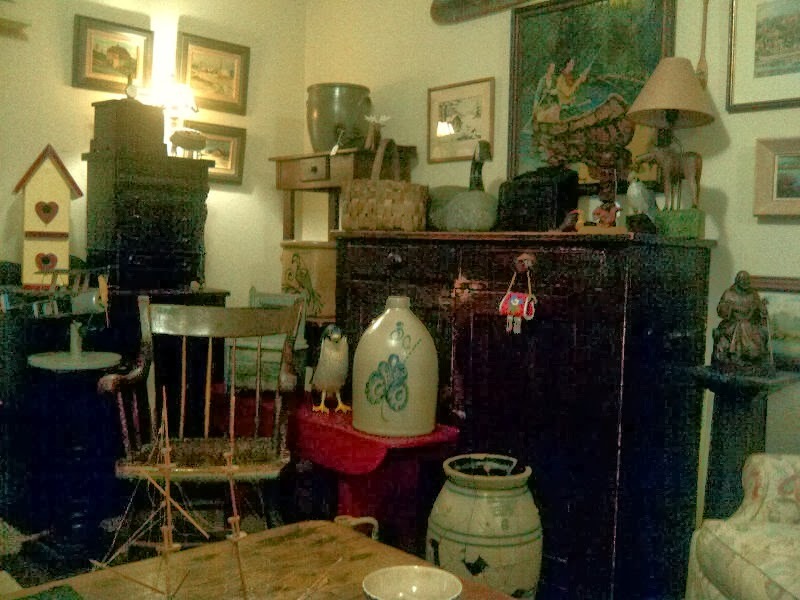 I guess in part that's what drove me into selling antiques and folk art - the surplus of items. But even selling objects on a regular basis doesn't solve the problem if there is more quantity coming in than going out! If you live in a rural setting with barns or enough terra firma upon which to build said barns, you are indeed fortunate. However, I know collectors who have also filled their available barns and sheds to the eaves. So even the barn blessed collectors can and do run out of space. I've also read of big time art collectors who solve the problem by leasing large industrial buildings in which to showcase their art. Is it any wonder there are so many of those commercial storage facilities popping up all over the place. I know more than a few collectors who are using them to store their finds. Like it or not, the collector's day of reckoning must come. In my case, for example, with six cupboards in the house and two in the garage, any future cupboard would have to be a flat out jaw dropper to get into the collection. Ditto blanket boxes. I've got several of them. Lamp tables? An easy half dozen or more. Tables, yes - a harvest type, two round ones, another harvest type that serves as a coffee table. Plus there are various washstands, servers, pedestal tables, bucket benches etc. I haven't even started to talk about the folk art on the walls. Not much space left there either! In one way, it's fortunate that the supply of stellar country furniture has dropped off in recent years. I don't have the place to put anything anymore! Even with a sharply curtailed supply, I still see pieces in the back's of picker's trucks that make me swoon. The Internet also gives one a constant view of antiques and folk art and there are many occasions when I see something on offer I'd like to own. I'm not sure where this blog post is taking me in terms of an argument. Perhaps the underlying theme should be to collect "slowly". I know if you're new to collecting Canadian antiques and folk art, the feeling that you have to make up for lost time or that you have to hurry to build a collection of objects to admire is a strong one. You have to resist this tendency. Try to make a plan of what you want in your collection and where the object will be placed in your home. After 30 years of collecting, I've finally realized that I would rather spend more on one good cupboard than the same amount on five run of the mill type cupboards. So, collect slowly and focus, focus, focus. Set your standards high. Any piece coming into your collection must prove itself in terms of age, condition, surface, form and, ideally, provenance. Finally, think SMALL. Aim to collect "diminutive" examples of furniture. And I don't mean miniature in scale. Smaller scale, quality items will look better in your home and in the long run will appreciate more in value. Pursue small, decorative accessories for your collection. A decorated wall box is just as much a piece of art as it is an antique. You get the best of both worlds when you concentrate on antique decorative accessories. So, there you have it. Set high collecting standards. Keep the dimensions and scale smallish. Collect slowly, backed by a plan and a purpose. Doing so should produce a collection that is a joy to own and respects the available space in which to display it. However, you'd also be wise to keep a "man cave" option available downstream - just in case! Thanks for reading. Hope you find something great next week!